Here at Return Path, email is who we are. We live it, breathe it, and could chat about emojis and Sender Scores all day. But the majority of our customers are B2C, which operates a bit differently from our own B2B business. In the past, our own emails have been a bit… lackluster. Don’t get us wrong, we relay interesting information, but our subject lines and preheaders left some to be desired. We played it safe – and our metrics reflected it. Over the past year and a half, we sought to be more verbose and innovative with our subject lines and the content we feature in our newsletters. One of our company values is that we are unconventional – and we revised our newsletter to reflect it. Our metrics have improved – and our list size has grown. And as a result, we also recently won an MQ Marketing Award from The Marketer Quarterly for Best Subject Line! We have nominated customers for MQ Marketing Awards before, but this time, we also submitted our own application. Specifically, we focused on the email series for our new Email University microsite. To promote it, we first used our newsletter, and then a series of reminder emails to let subscribers know that a new quiz was available. We sent emails on a biweekly basis as the quizzes were made live. Our goal was to provide customers, leads, and partners with fun, educational content to entertain and further connect with Return Path. We wanted to use a retro theme, but didn’t want our brand to seem outdated as a result. We needed it to be obvious that we had a theme we were working with—something we accomplished with the style of the emails and microsite, as well as the copy and creative. By seamlessly combining these elements, we were able to convey the fun, retro theme while also including valuable content in the campaign. 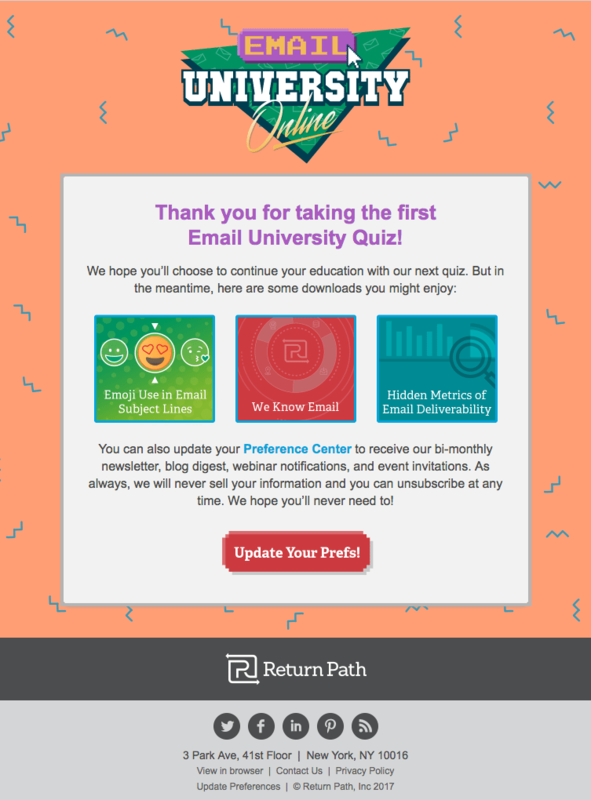 We were very pleased with the outcome of Email University and have decided to continue with a series of quizzes. We saw higher than usual email open rates—higher than previous email campaigns to this audience and our biweekly newsletters. We also heard customer feedback that people enjoyed it and were amused by the theme. So B2B email marketing can be exciting. We don’t push the envelope nearly as much as a brand like Chubbies (seriously, sign up, their writing is amazing), but we’re proud of our progress. If you’re not on our newsletter list yet, sign up here. We promise it’s worth your while. 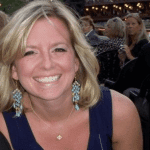 Brittany is a Digital Marketing Coordinator at Return Path. You can find her writing through our corporate social media channels - Twitter, LinkedIn, and Facebook. Outside of work, you can find Brittany spending time with her family, walking her dog, or cooking up something in the kitchen a la Martha Stewart. Connect with her on LinkedIn.